Microblading your Brows with Bri Kirsch, will turn back the clock (before the 1990's happened) and fill in those thinning, sparse, over-plucked and over-waxed brows. You can save the time it takes to get ready in the morning and spend it on taking over the world! 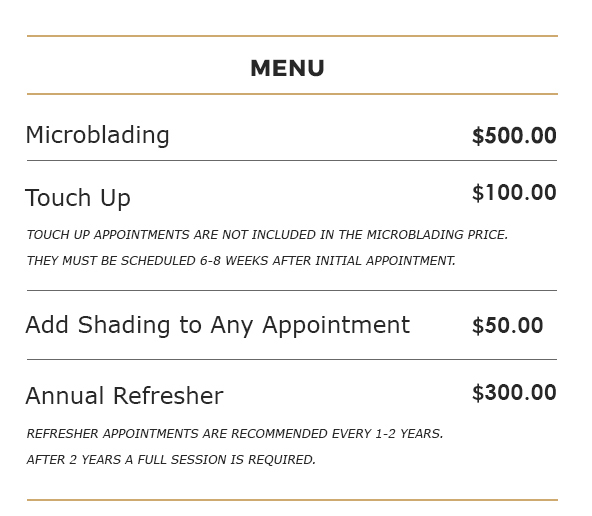 Microblading is a new and updated semi-permanent make-up technique where, through manual process of inserting pigment into the upper layers of skin, “hair strokes” are placed to create the desired fullness and shape of the eyebrows. A microblade is a hand tool with a line of tiny needles. It is dipped into pigment and a small line resembling a hair stoke is deposited under the upper layers of the skin. Hair stokes are placed strategically to match the existing hair growth and accentuate it or to add density and the look of hair where there is none. As a precaution, I do not perform cosmetic tattooing on pregnant or nursing women. Cosmetic tattoo treatments are considered semi-permanent and will not wash off, however, they will fade over time and may need to be refreshed every 1-2 years. Frequency of sessions depends on a number of factors including: the pigment color used (lighter colors fade faster), lifestyle (sun exposure), and if any chemical peels come into contact with treated areas. Please note that final results CAN NOT be guaranteed as each unique skin type will hold pigments differently and break down at different rates. I will re-evaluate how your skin has received the pigment at your second session and make any changes necessary. Multiple sessions are normal for cosmetic tattoo procedures, with each new procedure requiring a minimum of 2 visits. Your second session will be booked 6-8 2eeks after the initial appointment. Additional sessions will be charged according to the current pricing. For most clients, a minimum of two treatments are usually needed, at least 6 weeks apart. With most procedures, the color looks dramatically lighter after the first week. Some clients prefer this, while others like a bolder look. At the second session, I will assess the color retention and make adjustments as necessary. Everyone heals differently and at different rates. If your cosmetic tattoo does not heal perfectly after the first session, do not worry! I can always go darker and add more density at your next appointment.